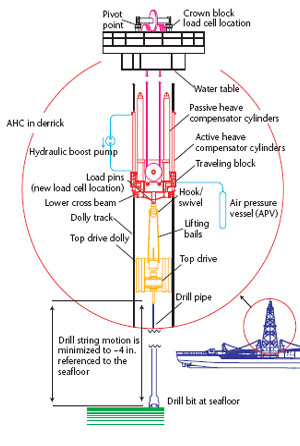 Heave compensators are used to compensate the relative motion between the vessel, its equipment and fixed reference such as platforms or the seabed. The absolute position is determined in real-time as an input signal for the control system. Depending on this signal the system will pay in or pay out to keep the load at a constant elevation. The performance of a Heave compensator mainly depends on the used hydraulic system. The Hydro Space Research in the Offshore field has developed an innovative concept for hydraulic control of Heave compensators under consideration of the technological and economic aspects. In addition to security, reliability, availability and performance aspects we focused on the energy efficiency and environmental protection as major priorities. The flexible and modular hydraulic system of Hydro Space allows you to configure easily the needed functions and options of your Heave compensator.